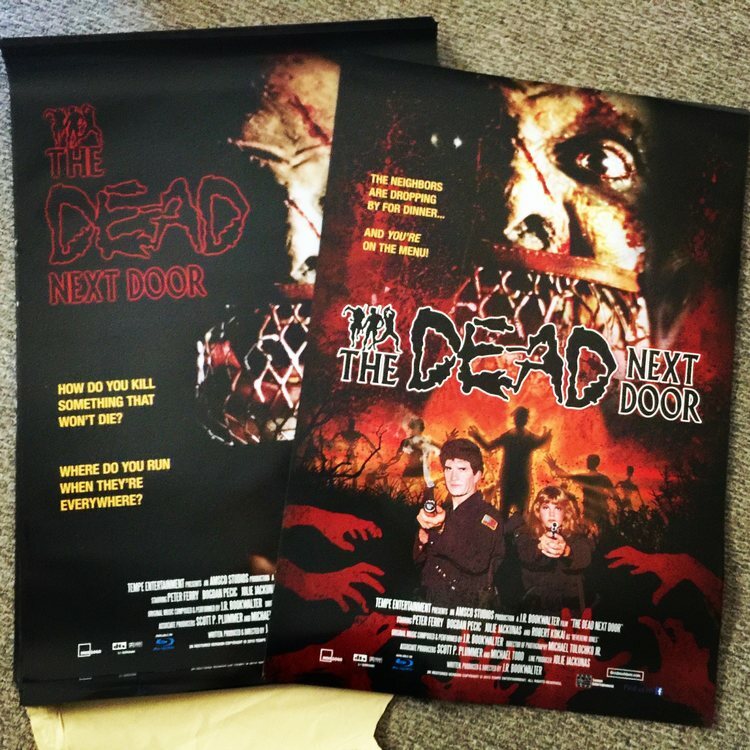 Digi-Schlock: THE DEAD NEXT DOOR (Tempe Blu-Ray/DVD/CD Set) – Schlockmania! Micro-budget horror mogul J.R. Bookwalter has directed over a dozen movies and produced even more. The root of that little empire is The Dead Next Door, his debut film and a title that has been popular on home video since the days of VHS. The last time it was revisited for home video was a nice 2005 Anchor Bay DVD that represented the first from-the-8mm-reels remaster of this film. Ten years later, Bookwalter has returned to this title with the latest film transfer technology to produce an extras-laden triple disc presentation that looks to be the last word on this fan-favorite title. To begin with, this set acts as a history of this title on video by presenting every transfer of it done to date – two on the blu-ray and two on the DVD. The blu-ray versions are drawn from a new 2K remaster done by Bookwalter – an anamorphic version carefully rematted for 16×9 monitors and a 1.33:1 version take that respects the original shooting ratio. Both look great, bringing out as much color and detail possible from the 8mm source material while also cleaning up the scratches and debris that have dogged previous presentations. The DVD features the original VHS version, where all the footage was transferred to video for post-production, and the Anchor Bay 2005 version, which goes back to the film elements but doesn’t feature the cleanup of the 2015 remaster. Both understandably look primitive compared to the blu-ray but offer a vintage thrill for those who first experienced the film in these versions. The standard-def purists out there will no doubt to be happy to have these options. Both blu-ray versions of the film have 5.1 and 2.0 stereo mixes in lossless form while the DVD offers a 2.0 stereo mix for the original video version and 5.1 and 2.0 mixes for the 2005 remaster. The 5.1 mix is the most recommended, particularly in lossless form, as Bookwalter has fun spreading out Bruce Campbell’s sound design across the speakers. It’s worth noting you also get a 5.1 lossless mix on the blu-ray taken from the original sound elements: it’s rougher-sounding but an admirable amount of cleanup has been done on the production sound and it allows you to hear the original performances. This set also offers enough extras to keep you going for hours. The following is a breakdown. Commentaries: There are three total. The blu-ray features a new commentary track with Bookwalter, and actors/production staff Jolie Jackunas and Scott Plummer. The vibe is celebratory and nostalgic, with everyone sharing memories of learning how to make a film the hard way and how people often filled acting and production roles. The DVD features two more. The first is a commentary from the 2005 DVD with Bookwalter, actor Mike Todd and D.P. Mike Tolochko. This track is more self-critical, albeit in a lighthearted way, with plenty of detail on the technical challenges of shooting a feature in 8mm. The other DVD track was done by Doug Tilley and Moe Porne of the No-Budget Nightmares podcast. It’s a fan track that pokes fun at the story’s multiple logic problems while also expression appreciation for its scope, gore and interesting take on zombie lore. Restoration Of The Dead (19 min. ): this sitdown with Bookwalter is the most informative of all the extras. He explains the complex post-production history of the film, including how he has edited it three times and remastered it twice. Along the way, it illustrates how the technology used for post-production has changed over the last few decades – and it will give you a brand-new appreciation for the filmmaker’s perseverance in preserving his best-known film. Screenings: These are quick segments on two recent Ohio screenings of the film, one in Cleveland (12 minutes) and the other in Akron (16 minutes). The first features some fond testimonials from cast and crew members while the latter offers a screening intro and a solo Q&A by Bookwalter. Behind The Scenes Footage: (19 min.s): a mix of 8mm and camcorder stuff, all narrated by Bookwalter. Deleted Scenes & Outtakes (7 min. ): of interest to fans is a glimpse at the first, too-dark version of the farmhouse scene, which features Josh Becker as a zombie. Additional Extras: There are four animated image galleries: international video covers, behind the scenes, production stills and a complete set of storyboards for the film. A new trailer for The Dead Next Door wraps things out alongside spots for two other late 2000’s productions. The Dead Up North (9:30 min. ): Bookwalter debuts the film in Canada in 2005 at a festival. This captures a Q&A session that involves a mention of an unproduced sequel to the film. Local T.V. Appearances (15 min. ): fun file footage, including a few local T.V. reports and an interview – but the best is Bookwalter appearing on a horror host show with a couple of zombies. Local T.V. Commercials (2 min. ): two spots, the funniest of which involves someone making illegal VHS getting being attacked by zombies. Making-Of Excerpts (9:30 min. ): this looks like a rough edit of a 1995 featurette about the film. It’s mainly a chat with Bookwalter intercut with some behind-the-scenes footage. He seems a big beleaguered by the film business here, particularly in a closing statement that becomes a rant. Shorts: three of them, all between three and ten minutes. Bookwalter offers commentary on all three, two of those also featuring his young son. The director explains how one of the shorts, a riff on Fulci’s Zombie, was the acorn from which The Dead Next Door grew. 20 Years In 15 Minutes: a fast moving mix of 2005 interviews with vintage ones. It’s pretty entertaining, with the different viewpoints showing an interesting mixture of nostalgia and gallows humor. Jon Killough’s acerbic commentary is pretty memorable. Auditions (14 min. ): most of the principal cast members are seen in this reel of auditions – and most are asked to scream for the camera. 2000 Frightvision Reunion (6 min. ): the main focus here is a conventional panel where the comments are oddly cross-faded. Bogdan Pecic’s comments are unexpectedly touching. 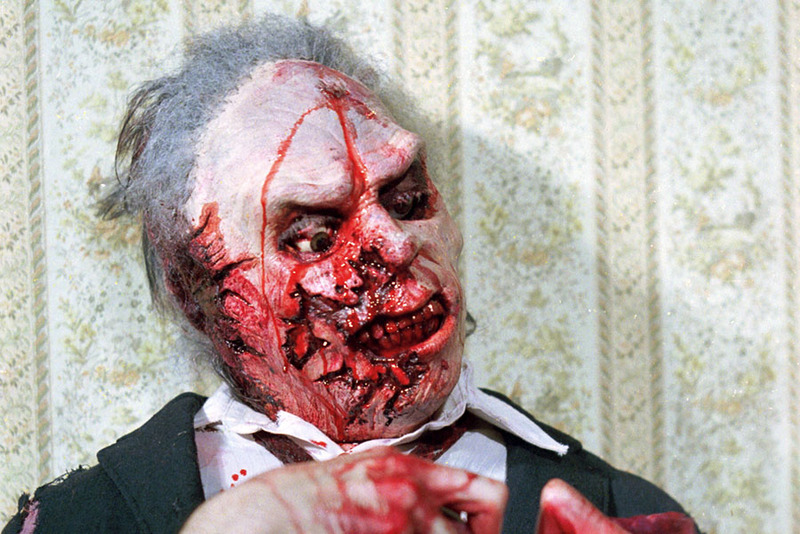 Additional Extras: 8 minutes of pre-visualization ” video storyboards” shot on camcorder that are compared with shots from the finished film and a gallery of trailers that feature a vintage The Dead Next Door spot plus four trailers for other Bookwalter-directed films. The final disc in this set is a CD of Bookwalter’s electronic score for the film. This is different from a previous CD of the score in that it also includes the songs by local acts included in the film, including that great new wave theme song that plays over the film’s end credits. Simply put, until video companies invent the next format, this is the final word for The Dead Next Door on home video. Tempe has done excellent work here and enthusiasts will appreciate the barrage of fan-friendly extras. 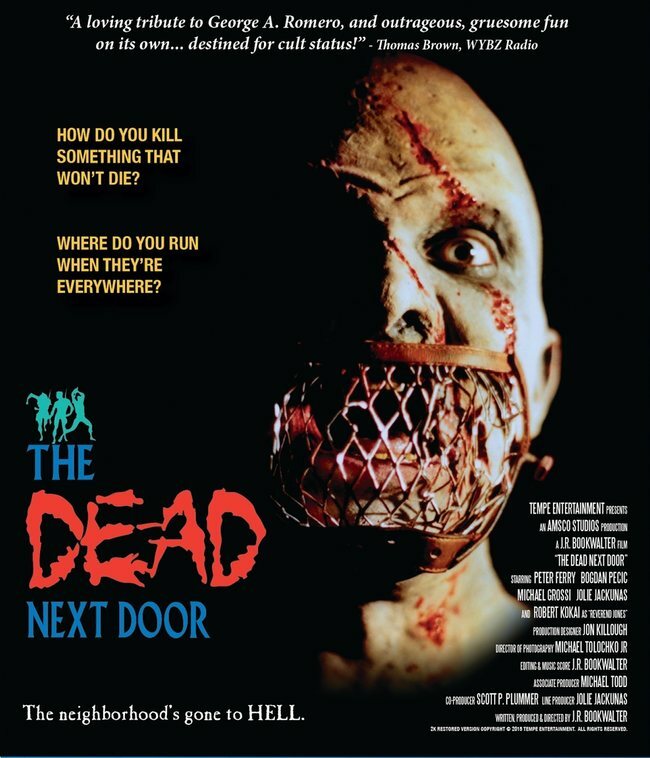 To read Schlockmania’s film review of The Dead Next Door, click here.